Become an ITIL V3 Expert with our Online ITIL Expert Training Program. This exclusive Online ITIL Expert Program includes all 5 ITIL Intermediate Lifecycle courses and ‘Managing across the Lifecycle’ (20 ITIL Credits). Six courses in total. - If you are only ITIL V2 Foundation qualified, then we will ‘bridge’ you up to V3 - by providing you with the ITIL V2-V3 Foundation Bridge free of charge. - If you are not ITIL qualified in any way, then we will provide you with online access to our ITIL V3 Foundation course – free of charge. ITIL Version Three builds on Version Two with the addition of several important new processes, across the new service lifecycle. It is critical that you know how to successfully design, build, test, implement and improve service management processes to obtain the benefits so often touted by organizations around the world. This special Podcast, the first in a two part series, features an in-depth exclusive new interview with David Clifford of Pro-Attivo (www.pro-attivo.com). David answers many detailed questions on how to proactively go about the business of successfully implementing ITIL processes. - What exactly are policies, processes, procedures and work instructions? - Why are these documents SO important? - What is the 'production process' for designing processess and procedures? - What real world benefits do these important documents realize? - How should these documents be owned within a service management organization? - What are the key steps involved in testing and implementing? - How can you identify and drive continual improvements? - What about the people involved in creating and managing these documents? David also covers all of the above answers within an ISO/IEC 20000 and ITIL context and offers some tips for how to successfully plan for ITIL version 3 process implementation. If you have any questions or thoughts on this Podcast - please post your comments below! Here is the second Podcast, in the two part series, covering the topic of how to successfully design, build and implement ITIL based processes. Grab Your FREE Complimentary Copy Now! Just released - this new ITIL V3 Report - Packed full of examples on how to design and build Service Operation Processes for ITIL V3. Download Your FREE Copy Now - Limited Time Only! (Just Click the Link Above To Get Instant Free Access). Quickly absorb and learn new perspectives and techniques to compliment your ITIL knowledge through the power of audio and Podcasts. In this special Podcast, I interview Don Casson, CEO of Evergreen Systems about Leading Transformation. Evergreen Systems began business in 1997 with the sole focus of helping large, complex organizations significantly and permanently improve the way they run IT. Don has more than 17 years of experience in leading, building, managing, and operating technology companies. He has led market development and technical direction of business units focused on internal and external call center solutions, network management systems, complex networks, and workflow/document management solutions. During his career, Don has been responsible for building and leading multiple national sales teams. Before co-founding Evergreen, Don was Executive Vice President, and the third employee of GMSI. During Don's five-year tenure there, GMSI grew from 3 employees to 175 employees and over $17 million in annual revenues. Inc. magazine recognized these efforts by listing the company in the top 100 on their list of the 500 fastest growing, privately held firms in the US. This interview was just so powerful - I've added it as a bonus item along with the full call transcript and an exclusive slide deck about Transformation - into the IT Service Mastery Program. As we know, the implementation of ITIL is often a major transformation activity for organizations wishing to move away from 'managing by technology' and technology silo's, to managing by delivering services. The shift is too easy to read in words and the uninitiated can be forgiven for thinking that moving towards Service Based Management is straightforward... it's not. 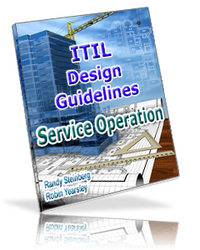 Leveraging the core of the IT Infrastructure Library (ITIL) best practices, as specified in the OGC's core texts, is a massive under taking. Leaving the planning, costs, resources and tools aside for a moment, it's often the actual organization, culture, politics, engrained behaviours and attitude that really makes the difference between a successful implementation (or enhancement) and a failure. Right now, the whole Industry awaits the delivery of ITIL Version Three, the so-called 'refresh'. What we know is that this is the biggest change to happen in the ITIL world for some years. I've been advising clients, students and organizations for many months now - to START preparing to learn, adopt and adapt only those elements of ITIL Version 3 that make REAL WORLD business sense to do so. This means that the business case and the ROI must stack up when scrutinised by the Financial Guys. Otherwise - it just ain't worth doing. No ITIL Version 3 for ITIL's sake! The actual thought processes, techniques and approach that Don explains during this important Podcast are, for my money, absolutely 'spot on'. So, why not listen in and learn more about what's involved in the Transformation Process within the context of IT Service Management and ITIL. It's a fascinating perspective that will really get you thinking about your own ITIL V3 projects and programmes over the coming months. In essence, we're all going to be 'transformers' in the not too distant future! - What does a Transformation Journey, in the ITIL context, consist of? - Why the #1 challenge is 'human resistance to change' and what you can do about it! - What characteristics and behaviours are necessary for successful ITIL implementations? - Does the Classical Approach to Transformation really work? - Do Kotters Eight Stages of Change really apply in the ITIL context? - Why 'the capacity to change' is so important to ITIL based Transformations. - Why communication and expectations management are critical in the process. - The importance of being educated, from ITIL Foundation onwards. To download the Podcast, simply right click and select 'save target as'. Why not transfer these MP3 files to your iPod or other MP3 player and change boring 'commute' and travel time into interesting 'development' time? Got a comment you want to share? Click comments below and have your say! 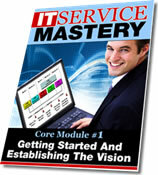 Last December a new and unique 'education product' was quietly launched onto the market, specifically designed to accelerate the learning process for ITSM Professionals who have responsibility for any aspect of ITIL Implementation. This Program combines online access to a powerful combination of structured audios, PDF's, Excel Spreadsheets, Word Templates and Powerpoint Slide Decks - all designed across four core modules to take ITSM professionals step-by-step through the entire ITIL Implementation Process. "It's turned what would have taken decades into just four weeks for me", explained US based Operations Manager Ralph Davies, "no-one ever actually shows you HOW to implement ITIL correctly after you've completed your ITIL Certification - but this Program really does." During the few months over 114 other ITSM professionals have successfully learnt and developed new insights, techniques and customised their very own ITIL based project materials to help them deliver new ITIL initiatives, projects and programs for their clients, customers or organizations. The Program contains over 12 hours of audio tuition, backed by supporting materials, checklists, templates and plans - in fact everything you need to successfully plan, develop and deliver an ITSM based project. Co-created by two experienced ITIL Masters Consultants, with over 36 years practical real world experience between them, this Program is perhaps the best kept 'secret' in the ITIL world today. Now, for the first time, a specially written IT Service Mastery Program Guide has been developed to reveal exactly what's inside the Program and explain the real world benefits it helps realize. Quickly absorb and learn new perspectives and techniques to compliment your ITIL knowledge through the power of online audio and Podcasts. In this first of a special four part series - we'll be delving into the good old Service Catalog - the laminated book of dreams that promises so much to our customers but often never quite delivers. 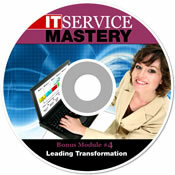 This Podcast is just a tiny fraction of the content within the IT Service Mastery Program. Within the Program you also get a special PDF explaining much more about the points Matthew raises as well as a fully edited 21 page call transcript. Again, this is just a tiny fraction of the overall Program content! With this 2 part Podcast we are going to learn much more about the Service Catalog - for example - did you know that it is definately taking a higher priority (along with the Service Portfolio) within ITIL Version 3? This Podcast is actually an interview with Service Catalog expert, Matthew Burrows of BSM Impact, a UK based ITSM consultancy. Matthew has many years experience of planning, designing, building and implementing Customer centric Service Catalogs utilising a number of different vendors tools and supporting methods. In this exclusive audio interview, Matthew reveals the answers to many of the most burning questions behind exactly what it takes in the real world to get the most benefit and value from a Service Catalog initiative. - What exactly is a Service Catalog? - How can Organizations realize benefit from their Service Catalog? - What's important in Designing and Building a Service Catalog? - Where's the best place to commence a Catalog? - What are the key implementation steps? - What are the important 'measures of success' with this initiative? - What are some of the best tools to use to support your Service Catalog? - What are the key challenges and pitfalls of implementation? - What opportunities will ITIL Version Three open up? To download this Podcast to your PC - simply right click and 'save target as'. Matthew Burrows continues his Podcast interview with part two in the two part series and follows up the advice he gave in part one with his very own 'top tips' for successfully implementing the Service Catalogue. What is the CMDB? By Kia Behania, BMC. Whilst we continue to plan several new ITSM and ITIL PodCasts, we would like to feature some highly recommended existing Podcasts for your listening pleasure. In this podcast Kia discusses the origins of a Configuration Management Database which revolves around change and configuration management and ITIL best practices. Kia Behnia has helped develop BMC’s Change and Configuration Management (CCM) strategy; prior to joining BMC Software he was CTO for Marimba, and earlier in his career, he was one of the principal technologists for Tivioli Systems. Whilst we build up our forthcoming library of great Service Podcasts for your listening pleasure, we would like to acknowledge several other Service related Podcasters who are providing excellent quality Podcasts to the wider IT community. Today, to get things moving, we feature an excellent Podcast from http://pmpodcast.blogspot.com which includes an insightful interview by Cornelius Fichtner (the chief Podcaster at PMPodcasts) with Robert Perrine (Bio below). Cornelius Fichtner has been working as a Project Manager in his native Switzerland, in Germany and in the USA for the last 15 years. He has led projects for a management consulting company, a national retailer, an internet startup company and one of the oldest financial service providers in the USA. His passions are project management methodologies and PMOs. He currently lives in Irvine, California, USA with his wife and their two computers. As well as his dedication to the Project Management world it's clear from his extensive Podcast library that Cornelius is very keen to cover some major service topics within the Project Management context too. I highly recommend his PMPodcast site to any aspiring or accomplished IT Service or Project Manager. Keep up the great work there Cornelius! We hear a summary of each of the ITIL Service Support and Service Delivery Processes, together with the background on ITIL. There are also some interesting perspectives on ITIL implementations. You can reach this interview and download it here. So, who is Robert Perrine? Robert is certified both as an ITIL Service Master (ITIL-SM) and as a Project Management Professional (PMP). He has managed complex integration projects and has experience with multi-national projects as well as an extensive background in IT. Today Robert is a Senior Product Development Manager with a finance company located in Irvine, California. Robert has managed operational teams, development teams and customer support teams. He has an extensive background in the design, development and administration of databases. He has designed and coded complex communications interfaces. He is a volunteer teacher with the Orange County chapter of Project Management Institute (PMI). Roberts also taught ITIL Foundation Certificate courses and graduate level college course in telecommunications, database administration, software engineering and programming. That background gives him an excellent foundation in communicating complex subjects and presenting material to a technical audience. In his own words, Robert also tells us, "I have seen the world of IT from the inside as a programmer, database administrator, manager, IT Director, teacher, project manager and head of a PMO. Certified both as an ITIL Service Master (ITIL-SM) and as a Project Management Professional (PMP) I strive to combine the strengths of the change-agent and the process-proponent. My current position at Ameriquest challenges my ability to blend the temporary and unique world of projects with the repeatable and consistent world of operations." Visit http://pmpodcast.blogspot.com for the full list of Podcasts!